Last month, the New South Wales Irrigators’ Council Policy Manager wrote about water reform in Australia in preparation for the Murray-Darling Basin Ministerial Council Meeting in Adelaide. Today, Stefanie Schulte authors a follow-up piece reflecting on the meeting’s outcomes and the future of water reform in the region. You can never be quite sure how a Murray-Darling Basin Ministerial Council (MINCO) meeting will turn out, but 2016’s final session was particularly unconventional. The ‘water is for fighting over’ adage certainly came to pass as the gloves came off in Adelaide on 18 November between Australia’s Murray-Darling Basin water ministers. They were supposed to be negotiating the next steps in the implementation of the Murray-Darling Basin Plan 2012 – including progress on the non-flow “complimentary measures”. When you compare the official Murray-Darling Basin Ministerial Council meeting communiqué with the media reports that were released subsequent to MINCO, you might think these were two completely different meetings. Officially, water ministers acknowledged the Murray-Darling Basin Authority’s work on the Northern Basin Review, discussed the impacts of the recent floods in Australia, and were briefed on the Sustainable Diversion Limit adjustment mechanism. In contrast, media coverage spread a sense of ‘doom and gloom’ for the future of Australia’s Murray-Darling Basin Plan and declared Australia’s long term water reform process all but dead. Fact is, everyone had something to say about this last MINCO for 2016 – most of which was simply empty rhetoric. Reports included stories about heated debates – spiced with very explicit language – between different ministers; accusations from all sides of Australian politics; and polarising media claims from various opposing stakeholders. There was talk about pretty much everything…except the task at hand. What is there still to do? Although we are ‘nearly there’ in terms of the Australian government’s environmental water recovery, an enormous amount of work needs to be completed before the Murray-Darling Basin Plan comes into effect in 2019. Firstly, we need to finalise the Northern Basin Review. While the Murray-Darling Basin Authority has proposed reducing the total volume of planned environmental water recovery in the Northern Murray-Darling Basin from 390GL to 320GL, a further 42GL of water will need to be recovered to meet the target. The remaining water will need to come from water license holders in Queensland and New South Wales. Most of the recovery will come from the state of Queensland, but the Murray-Darling Basin Authority has proposed an additional 11GL in environmental water recovery from just two New South Wales valleys – even though the state has already recovered 7GL more than its required total reduction target. We are faced with this curious situation because the Murray-Darling Basin Authority sets ‘local reduction targets’ in individual valleys and ‘shared reduction targets’ across regions. The distribution of these reductions can be nominated by the respective Basin states. In the Northern Basin review, the Murray-Darling Authority has switched the ‘shared reduction targets’ to ‘local reduction targets’ – effectively locking individual valleys into specific environmental water recovery targets despite an overall over-recovery in the state. The decision has led to some extraordinary circumstances. In New South Wales’ Barwon-Darling Valley, the original local reduction target was 6GL and the shared target 22GL. Now, its local target is 32GL and the shared reduction requirement zero. It should be mentioned that the current environmental water recovery target in the Barwon-Darling is 32GL. Convenient? Yes, a bit too convenient. In addition, it has also meant that there are some valleys in New South Wales that have experienced an over-recovery of environmental water – including the Gwydir and Macquarie-Castlereagh valleys. Combined, these two valleys have recovered 18GL more than their proposed total reduction targets. Unsurprisingly, questions have been raised as to how this over-recovery of environmental water will be addressed. This and other important issues still need to worked through over the 10-week consultation period for the Northern Basin Review, due to conclude on 10th February 2017. Secondly, we need to settle on a package of projects around the Sustainable Diversion Limit Adjustment Mechanism. As mentioned in my previous post, we only have six more months to agree to a package of ‘supply measures’ for the Murray-Darling Basin Sustainable Diversion Limit adjustment mechanism. To date, the Murray-Darling Basin Authority has modelled only 19 of the currently 37 notified projects with an indicative offset figure of around 400GL. The total adjustment can be up to 650GL if other ‘suitable’ supply measures can be found. To recap, these supply projects can be works, revised river operations, river management rule changes, or ‘other measures’ that enable the use of less water but still achieve the Murray-Darling Basin Plan’s environmental outcomes. A lot of work is yet to be done to scope and assess any further supply measures that could make up the remaining 250GL, including non-flow complementary measures like carp control, installation of cold water pollution mitigation infrastructure, and proactive wetland management. These non-flow measures are particularly important as they can lead to wide-scale environmental benefits without the need to recover more water. Unfortunately, they are difficult to assess, as we currently do not have ‘approved’ methodologies for calculating environmental equivalences. Thirdly, we need to have a discussion around the ‘Pre-requisite Policy’ and the ‘Toolkit’ measures. Pre-requisite (or unimplemented) Policy and Toolkit measures are broad range actions and rule changes that can maximise the use of the Australian Government’s licenced environmental water whilst at the same time ensuring the protection of water supply and reliability to other consumptive water users. Water shepherding – “the delivery of a calculated volume of water that was created by the non-activation/reduced extraction at a nominated licence location to a more downstream location, after the consideration of losses, where it will be made available for extraction or use for the environment”. It is yet to be determined whether (and to what extent) these measures or rule changes have adverse impacts on other water licence holders, how these might be mitigated, and who might pay for their implementation. Finally, we need to ensure that the states’ water management arrangements are compliant with the Murray-Darling Basin Plan 2012. The Murray-Darling Basin Plan requires Basin states to prepare ‘Water Resource Plans’ for each valley that are consistent with certain accreditation requirements. In most cases, these Water Resource Plans will incorporate existing state water management legislation, water management protocols, and manuals, but they will also include a suite of new policies and documents around environmental watering, water quality standards, trade, indigenous values, and risk assessment. 20 surface water “Water Resource Plans”, 22 groundwater “Water Resource Plans” and 6 combined groundwater and surface water “Water Resource Plans” need to be developed by 30 June 2019. To date, none have been finalised. And lastly…Where is the money? All these tasks are still ahead of us and time and money is running out. The Basin Plan 2012 is scheduled to be implemented by 2019 – two years from now. Significant work needs to completed, assessed, and accredited by various State and Federal departments and agreed by Murray-Darling Basin water ministers. However, funding for most Australian Government departments involved in water will run out by mid-2017 in line with the extant 10-year funding package. The Australian Government mid-year budget will be released next Monday. It may be a moment of elation or despair for those Departments tasked with implementing the Basin Plan. The figures have yet to tell. 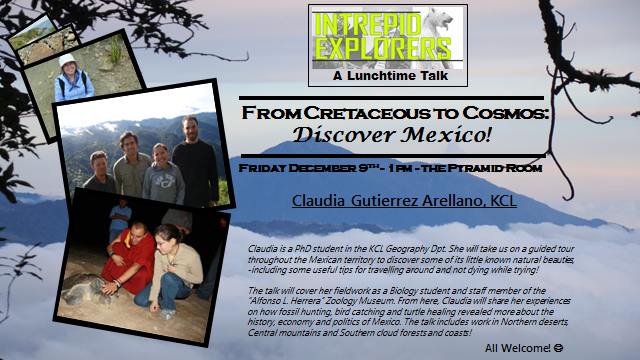 Join King’s Intrepid Explorers this Friday for a seminar including an exploration of Mexico’s cloud forests. From Cretaceous to Cosmos: Discover Mexico! As a biology student and staff member at the Alfonso L. Herrera Zoology Museum, Claudia will take us on a journey of her time in Mexico to discover some of its little know beauties. These include work in northern deserts, central mountains and cloud forests! This event is free and open to the public. Coffee, tea and biscuits will be provided. We hope you’ll join us from 1pm this Friday 9 December in the Pyramid Room (4th Floor of the King’s College London King’s Building, Strand Campus). This piece was originally posted on the London NERC DTP blog. Several of our King’s Water PhD students are supported by the Doctoral Training Programme. 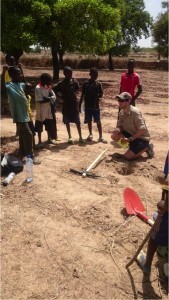 Here, third year student David Smedley shares his experiences working on an interdisciplinary team during fieldwork in the Volta. 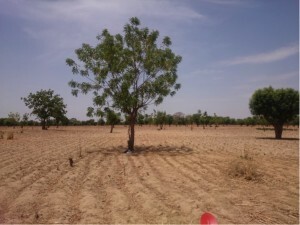 This particular field trip, to a section of the Volta river basin located in northern Ghana and southern Burkina Faso, aimed to collect baseline data for my PhD, as part of a larger project to improve livelihoods amongst smallholders, as well as the health and functioning of the ecosystems in which they exist. The Targeting Agricultural Innovation research group, part of the CGIAR Water Land and Ecosystems research program, is investigating agricultural systems with the duel ability to increase water use efficiency and enhance ecosystem services. Ecosystem services being those services provided by nature which society draws on, such was food, clean water, pollination, flood control, nutrient cycling and so on. Smallholders dominate much of the landscape in Volta, where most exist in a state of extreme poverty. However, the ability of these small-scale agricultural systems to meet the demands of growing populations is under severe stress, as changing climates and rainfall patterns conspire to limit farming yields, with a devastating effect on local livelihoods. My PhD is investigating the potential of zai, a traditional water harvesting technique used in the northern drier regions of the basin, to enable farmers to overcome dry spells in the growing season. This would allow them to increase their resilience to rainfall variability and increase crop yields, while also potentially having a positive effect on hydrological ecosystem services. In April 2016, members of the TAI team representing a host of institutions based in Europe, Africa and North America, congregated in the White Volta sub basin to collect a range of data. The linked blog post gives a great break down of the overall team’s activities. For the purposes of my research, the aim of this field trip was to collect of soil samples and infiltration data (that rate at which water infiltrates into the soil), which will be used as a baseline indication of the soil’s ability to capture and hold moisture. 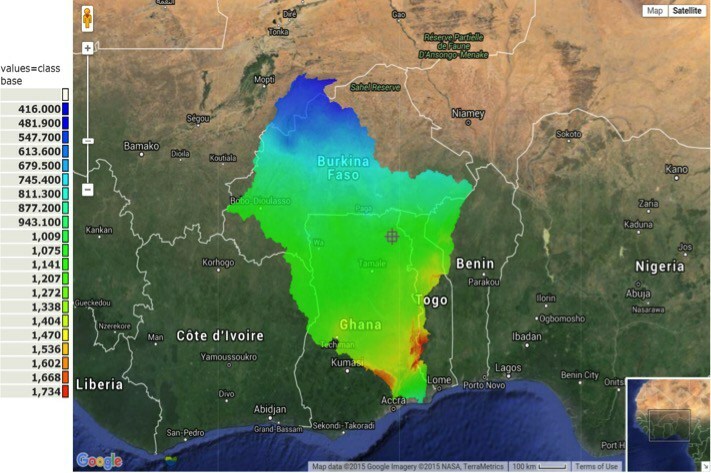 Samples were taken at seven sites across the TAI study area in Burkina Faso and Ghana and then processed back in the lab at Kings College London. The full meaning of this data will only be apparent once a full field trial over an entire growing season has taken place, which will kick off later this year in South Africa. However, one unexpected result was a high organic matter content at a number of sites, which is encouraging as this indicates better than expected soil health. Another aim of the trip was to demonstrate a FreeStation to a number of potential local partners. 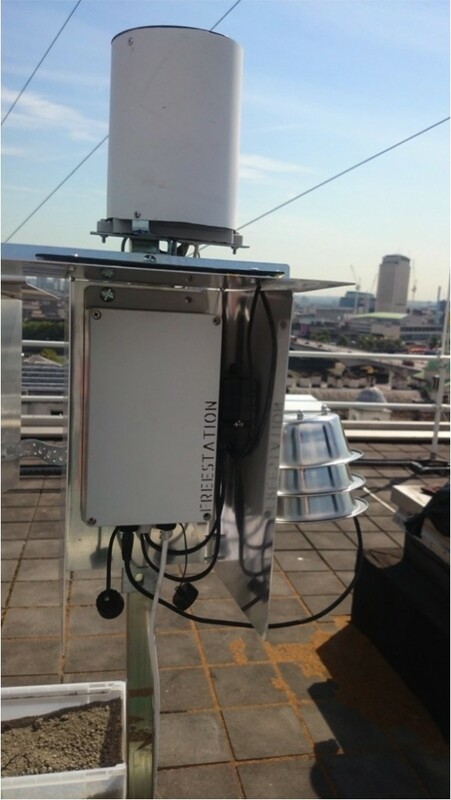 FreeStations, designed by Dr Mark Mulligan, are weather stations designed to generate reliable climatic information at the lowest possible cost, using open source hardware, software and 3D printing tech. A demo station was put together by Mark, Sarah Jones (of Biodiversity International & KCL) and myself and demonstrated to a range of potential partners from schools to local water managers. Since then, six more stations have been deployed by Sarah in the Volta and a further six are due for deployment in South Africa alongside my own field trials. The general response to the stations was extremely positive, and local partners clearly recognised the need, with large data gaps existing in weather records, particularly for the developing World. Spending time in the field with a multidisciplinary team, capturing data with everything from ground penetrating radar to drones was a fantastic experience, and not just because I got to use the drone for hours on end. Discussions while traveling or at the daily debrief and dinner table are where real conversations take place that immensely broaden your understanding of both the complexity of what it is you are tackling and what you can achieve by doing your bit and integrating it effectively with a larger team. Field trips like these give rise to situations where ideas and suggestions flow, and these can be debated and tested in real-time, which is something unique. They also force a broad array of scientific disciplines into a confined space, where each individual has the opportunity to practically understand what the others are trying to calculate and achieve. The value of this from both a learning and, even more simply, from an appreciation point of view, is priceless. For my own PhD the next step is to run a field-trial testing variants of zai under higher than normal rainfall conditions. The trials will monitor soil moisture, climate (using our FreeStations) and the health and final yield of the crop – maize. Simultaneously, I’ll be conducting a social study investigating the potential for creating climate data collection networks amongst farmers. Finally, on completion of the field trial, WaterWorld will be used to model the impacts of zai at larger scales, and predict what the large-scale adoption of the technique will mean for basin-wide hydrology. 1. Mulligan, 2016. Results from the WaterWorld Policy Support System [v2]. 2. Google Earth Pro 7.1.7, 2016. Volta River Basin, 9°30’28.16“N, 0°46’05.90”W, (accessed 7.14.16). The River Basin Processes and Management research cluster at the University of Leeds provides international leadership in understanding and managing environmental processes and feedbacks that control and link water, sediment, solute and biotic dynamics in river basins, estuaries and marine systems. The Cluster has recently announced a variety of funding opportunities for water research. A fully-funded NERC Industrial CASE studentship will examine the hydrological function of organo-mineral soils in downstream flood risk. We seek to understand hydrological processes operating in upland organo-mineral soils and how their management and vegetation cover influences river flow peaks. This novel field, lab and modelling project will expand our knowledge on the function and hydrology of upland soils which are of high conservation value. The project will directly provide urgently needed management decision-making evidence on upland soil management for flood peak reduction. Organo-mineral soils cover around 20 % of the UK, and are particularly common in upland areas with the main types being stagnohumic gleys and acid brown earths. Unlike peatlands, the function and hydrology of organo-mineral soils is globally very poorly understood with major gaps in the literature. These soils typically underlie upland heathland and grasslands in areas with high conservation value. It is unclear whether these soils are dominated by throughflow (and what their typical permeability range is), infiltration-excess overland flow or saturation-excess overland flow in different topographic contexts and rainfall events. It is also unclear how management of organo-mineral soils impacts their role in runoff generation. There is an urgent need for evidence on ‘nature-based’ flood management solutions, particularly in UK uplands – source areas for the UK’s major rivers. Recent modelling work on peatlands by researchers at the University of Leeds has shown that controlling overland flow velocities by changing the surface cover conditions in key spatially identifiable parts of the catchment can play an important role in reducing flood peaks (by up to 20 % for some rainfall events) (Gao et al., 2016). However, we do not have data from organo-mineral soils, which are likely to function quite differently to peat, to inform such modelling and so practitioners have limited basis for upland management decisions which may benefit those downstream at risk of flooding. The student will be part of the River Basins Processes and Management cluster in the School of Geography and water@leeds which is the world’s largest interdisciplinary university-based water research centre. water@leeds hosts 140 PhD students. These groups provide access to routine training through seminars, structured feedback on project ideas and technical training. The successful PhD student will have access to a broad spectrum of training workshops that range from technical through to generic skills building. The supervisory team will provide training on soil hydrological processes and modelling. What causes the formation of pipes within peat? Public participation and economic analysis in European water management: Ne’er the twain shall meet? West Virginia University is pleased to offer a Graduate Research Assistantship exploring the social elements of the hydro cycle. See below for more details and to apply. Applicants interested in the Graduate Research Assistantships described below are encouraged to contact the research faculty prior to applying. Applicants must submit a CV and research statement addressing specific interests and qualifications for the potential research topics outlined below. In addition to the specific qualifications for these positions, potential candidates must meet the admission standards and be fully accepted into the Geology & Geography Department at WVU. Transcripts, test scores, and all other completed application materials are due January 1, 2017 for Fall 2017 admission. You can access the application portal here: https://graduateadmissions.wvu.edu/. WVU Geography offers both Masters and Doctoral degrees and a rigorous certificate program in Geographic Information Science. Our rapidly growing graduate program is composed of 19 core geography faculty with expertise in the interdisciplinary subfields of Human Geography, Environmental Geography and GIScience. WVU Geography faculty are engaged in local, regional and global research focused on human-environment relations, climate change, political geography, spatial science, digital humanities, forest ecosystem modeling, cultural and political ecologies, conservation science, feminist geography, science and technology studies, humanitarianism, land change science, critical cartographies, food justice, and development geography. Faculty are currently conducting research in South Asia, Latin America, Sub-Saharan Africa, the Middle East, East Asia and the United States, including Appalachia. There is an exhaustive literature on Israel, Palestine and water, which has documented how the asymmetric power of Israel in the Oslo negotiations ensured its control of land and water over Palestine. Less attention however has been paid on the interface of water, trade and agriculture, and the ways in which controlling trade, Israel controlled the virtual flows of water too. The concept of virtual water makes the water-agriculture-trade relationship visible, shedding light on agricultural trade flows in terms of water. Applying a political ecology approach, this paper shows how socio-ecological conditions are sustained by and organised through both social and metabolic-ecological processes. A biophysical analysis- the agricultural flows of virtual water from and to Palestine in the Post-Oslo period- is combined with the examination of the power relations that governed these flows. The analysis reveals that virtual water flows are not static but instead evolve within the (geo)political-economic context in which they are embedded, bringing to light Israel´s control over the flow of Palestinian agricultural virtual water. We argue that a political ecology approach to virtual water offers a theoretical basis to move beyond the currently techno-managerial emphasis in the virtual water literature, illuminating the link between the control of virtual flows and the consolidation of political and economic power. Registration is not required but do arrive early to be sure of a seat. Email an14@soas.as.uk with enquiries. WaterWords is the blog of King's Water, an interdisciplinary research group hosted by the Department of Geography, King’s College London. This dynamic group brings together the extensive experience and expertise of King's faculty as well as a range of PhD and Master's students. Core King's Water staff members include Tony Allan, Nic Bury, Michael Chadwick, Nicholas Clifford, David Demeritt, Robert Francis, Alexander Loftus, Bruce Malamud, Naho Mirumachi, Mark Mulligan, Daanish Mustafa, and Emma Tebbs. King's Water is an interdisciplinary group that works on the biophysical, political, socio-economic, developmental and institutional aspects of water resources and their management. Our work is international, with ongoing projects in Tanzania, Brunei, the Mekong, the Andes, the Amazon, the Middle East, and elsewhere. In addition to the development of the concept of virtual (embedded) water, we have led the development of transboundary water politics analysis, water governance, aquatic resources and sophisticated spatial policy support systems for water resource and ecosystem service assessment. WaterWords records King's Water work, outputs, events and interactions with water issues around the world. For more information about King's Water, please visit http://www.kcl.ac.uk/sspp/departments/geography/research/Activity-Hubs/Water/About-Us.aspx.